Facebook unprofessionally retaliates against Group Admins and Journalists who write unfavorable news stories about them. The new “Click-Gap” will look for domains with a disproportionate number of outbound Facebook clicks compared to their place in the web graph. Something that is designed to punish journalists whose content succeeds on Facebook’s networks in a way that does not reflect their established success outside Facebook. 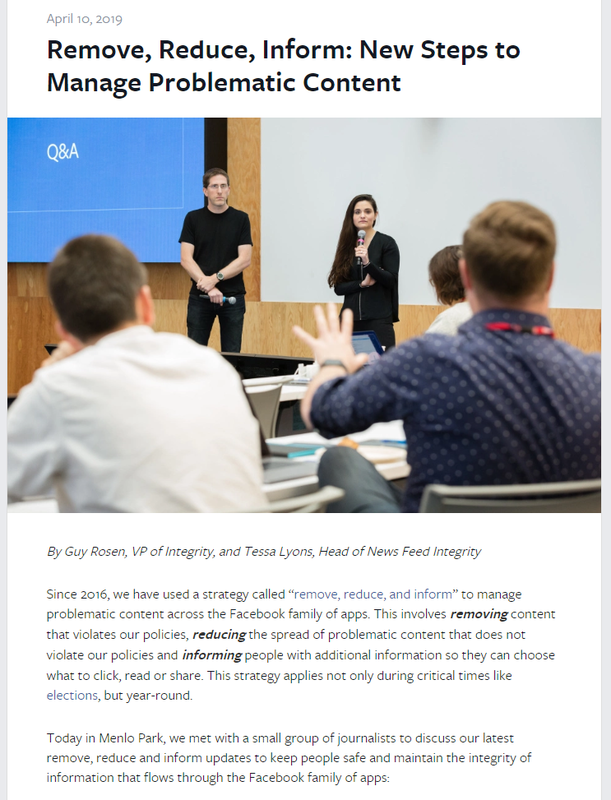 In addition Facebook’s software may delete Facebook groups based on how many times Facebook admins disagree with its frequently misidentified AI based recommendations that a post is either spam or against community values. The problem with this is that the AI is almost always wrong, and so Admins who are doing the right thing may have their groups deleted by Facebook code. Many Facebook group admins have spent years growing their Facebook groups and many indie journalists have spent years growing their ratings and reputations through article sharing in Facebook groups. For Facebook to crack down on journalists who receive their traffic primarily through Facebook is disheartening given that these journalist may have made years long investments in growing their network and reputation through Facebook’s networks and not elsewhere. It is also disheartening that Facebook may delete Facebook groups based on admins finding disagreement with its frequently wrong assessments based on its neural networking (AI) software. The traditional media owned by Rupert Murdoch may have influenced Facebook’s decision to crack down on independent journalists growing their news brands on Facebook’s networks, as this policy hurts the underdogs but leaves the established news brands unscathed. Can you imagine if youtube purposely worsened the traffic of youtubers who were not already eatablished media on television? That would help big television but it would hurt pretty much all youtube influencers who are not already big outside youtube. It reminds you of that scenario teenagers face, trying to find your first job, but all the job listings require previous employment, well how then does someone get started if the world place is tilted toward protecting the establishment from new comers. Shortly there after in November or December I noticed that the number of people in my facebook group had gone from 13,000 to 3,000. Someone at Facebook had deleted 10,000 members from my group. In what I now believe was retaliation for posting an article they did not like. Soon after I discovered that I was not invited to the March 2019 invite only press event unlike the previous year, and I was also taken off the press invite list to F8, whereas I had attended F8 the prior year as well as OC5 and OC4. Facebook, in a very unprofessional manner had retaliated against me personally for writing an article they did not like. It’s not just me, Facebook’s relationships with the press seem to be deteriorating all over the place, their unprofessional way of retaliating for stories they don’t like actually creates additional problems for them in all the wrong places. In order to make up for the fact that they are losing friends in the media all over the place Facebook has decided to start flying youtube influencers from all over the world to events where it has booths such OC5, GDC, and Pax East, and F8. “For now, YouTube reigns supreme, with the most-followed folks — 7 million subscribers or more — able to command $300,000 for a video partnership. So VR influencers should be aware that Facebook, a rich company, is actually being very cheap and stingy to them by ONLY giving these VR influencers flight and hotel fare. Disclaimer: Silicon Valley Global News’s youtube channel has 117,649 views but its not yet generating hundreds of thousands of fews per video unlike the top youtube influencers. Example of SVGN on youtube. Still can you really trust the multitude of youtube VR influencers who are given international airplane tickets and hotel rooms given that they know and you know that Facebook will retaliate against journalists and group admins who write stories that ask the public to review the facts about Facebook with a critical eye? If you admin groups and or post articles on Facebook maybe you should consider posting more of your content on youtube instead, by its actions it appears that rich Facebook employee’s think little of the youtube influencers they are exploiting and their potential partners in the media, enough that they are willing to sabotage your livelihood if you step out of line. So maybe invest your time elsewhere in a company that does appreciate it’s partners. A company that does give it’s partners what they want.